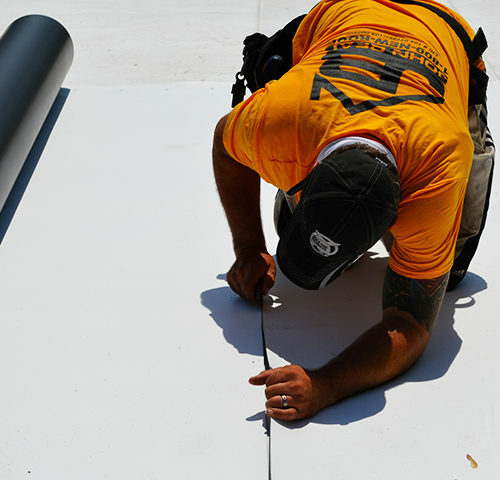 For the brave few who want to venture on your roof, we have some tips to keep you safe! 1. Don’t work on the roof alone. Let someone know where you are going and ask them to come out and help you. In case of emergency have someone there to help. 2. When you get up on your roof use a sturdy ladder. We suggest a ladder stabilizer that attaches to the top of the latter. If the legs of the latter are on loose ground, dig a hole around the legs until you find solid ground. You can also attach a board behind the legs to prevent slipping. 3. Be mindful of the weather. Water and wet materials, like leaves and wet shingles, can be slippery. If you feel uncomfortable with getting on your roof at all DON’T DO IT! Call a professional to come inspect your roof. 4. Wear sturdy shoes or boots with good traction. This will help reduce slipping. 5. Clean as you go. Nails and old shingles can be a hazard for slipping. Keep tools you are not using away from your work area. They can pose a trip hazard. 6. Attach a ladder to the surface of the roof and create a safe footing. Use a short section of 2×4 and nail them to the roof and move it as you go. 7. If you think the weather will change at any time, wait for a better day. A unexpected gust of wind or a sudden rain storm can be extremely hazardous. 8. When you are moving look at your feet. Watch for any thing that may be loose or not sturdy to step on. 9. If you are uncomfortable with heights or feel unstable on the ladder don’t climb on the roof. Know you limitations and call a professional if you feel uncomfortable for any reason. 10. Don’t do something that will cause more harm than good. If you don’t know what you are doing you can cause damage to the roof.